Mount Moriah has been in my sights for a while. It is the last mountain in the Carter-Moriah Range that I have not hiked and it is supposed to be a moderate hike and have a fine view from the summit. From research, most people suggest hiking it from Stony Brook Trail as the elevation gain isn’t as bad. Despite starting at 800′ and adding more up from summitting Mount Surprise, I decided to hike Moriah via the Carter-Moriah Ridge Trail. 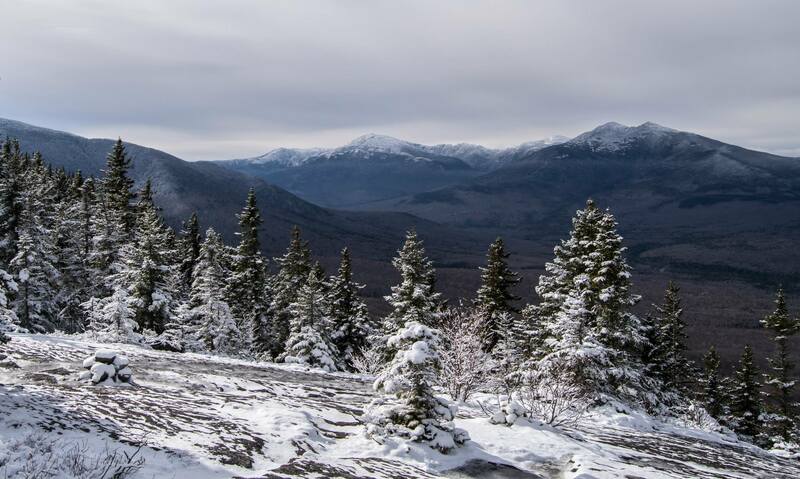 I planned on camping out overnight at Barnes Field, a group campground in Pinkham Notch. Unfortunately, due to complications at work, I left Portland a lot later than I anticipated. By the time I got to the junction with Route 16, where I planned to purchase firewood, Grant’s Supermarket was already closed. I headed up Route 16 as the snow began to pick up, excited about the night despite not having firewood. I would get to camp out in the snow and the forecast for the morning was clear for my hike. As I hit the height-of-land in Pinkham Notch by the Mount Washington Auto Road I also hit a whiteout. I slowed the car down to 35mph and concentrated on the lanes swerving through the forest and shifting in and out of view under the snow accumulation. I soon found the turn off for Barnes Field and took a slow swing around the campground looking for a good site. About half of the dozen sites were occupied. I took a site near the end of the loop and set up my tent in the snow. I had two beers to enjoy but no campfire by which to drink them, so a slow setup it was. 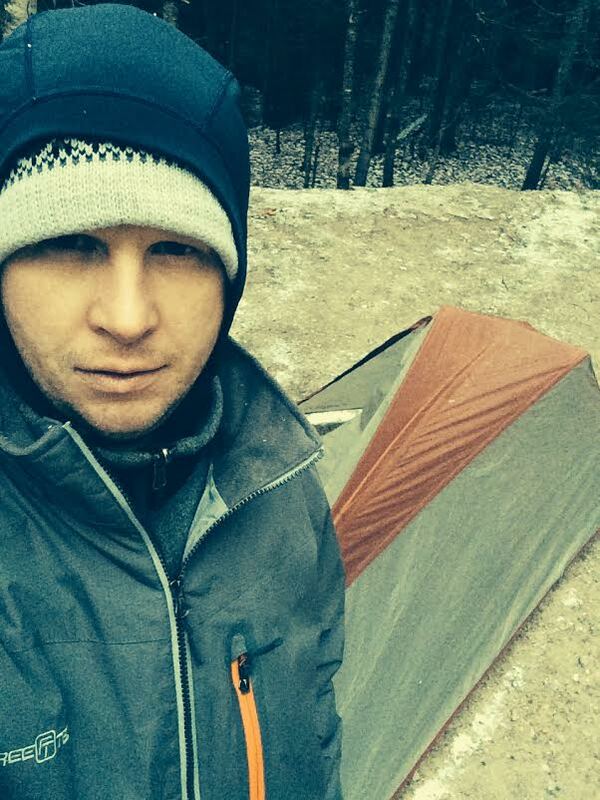 I learned a few lessons on staying warm from my winter camping test back in January. I had my fleece sleeping bag liner and my foam pad to increase the insulation between me and the ground. Though it wasn’t cold enough to put the fleece liner inside my 20 degree bag, I put it on top of my air pad and the foam pad below the air pad. Throughout the night I never felt my body heat being sapped by the ground, despite a slow leak in my air pad, so I suppose it worked. I also slept in my Under Armor Cold Gear, so in the morning I was still warm. I got up with the sun as I tend to do when camping and packed up. I cooked some oatmeal and coffee and ate an apple and banana, my typical pre-hike fare. I took the short drive up Route 16 toward Gorham, New Hampshire and made a last minute decision on whether I would park in Gorham or try to find the road-side parking on Bangor Street near the trailhead. 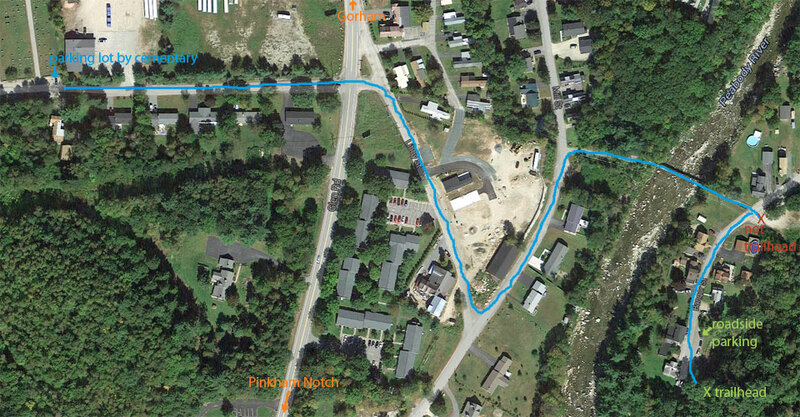 Since from my research it was not entirely clear where the trailhead or parking was and because I wanted to walk across the suspension foot bridge over the Peabody River, I decided to park on Promenade Road. With a little wandering I found my way to the suspension foot bridge and crossed the river (see the more direct route in the above map, blue line). The river was roaring and my footsteps made the bridge bounce up and down in a slightly unsettling but enjoyable way. On the other side I took a trail into the woods. I quickly realized that I was not on the Carter-Moriah Ridge Trail, but an ATV trail. I headed back out to Bangor Street and saw trail signs at the end of the street (duh) and really started my hike at 8am. The trail climbed sharply away from the Peabody River and then became moderate. I found a discarded coffee cup and shortly later a hat and jacket in the trail. I figured someone was bagging Moriah quickly and discarding their extra weight along the trail with intentions to pick it up on the way down. The trail leveled out some below the approach to Mount Surprise and snow started to appear on the ground. I could make out several pairs of boot prints marking the trail through the snow. Right before the trail climbed up Mount Surprise it penetrated thicker spruce forest and I was struck by the way the light snow made the moss stand out in a brilliant lime green. The trail climbed moderately again and eventually broke out of the forest and onto ledge summit of Mount Surprise. 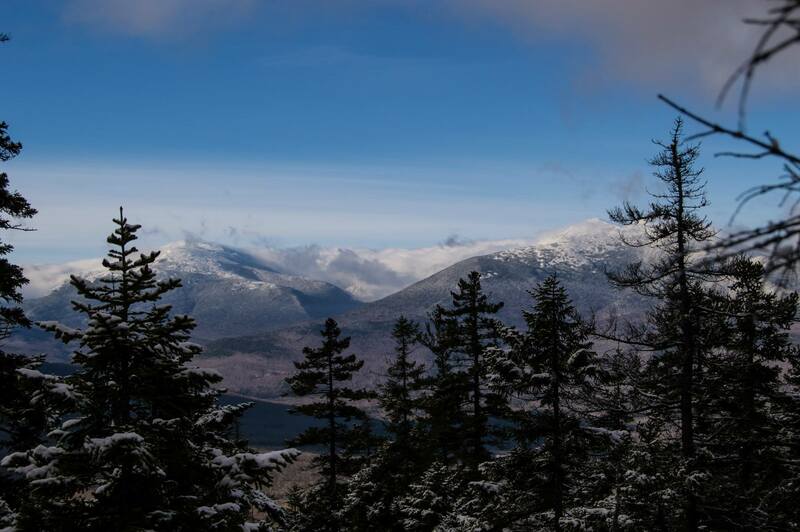 I got my first vista of the day, a nice one looking toward Mount Madison and Washington. As I slowly walked out onto the ledge with eyes transfixed on the view I hit a patch of black ice and went down on my left knee hard enough to make me curse. That marked the point where I slowed my pace and started paying attention to my footing. I had my STABILicers with me, but most of the ice was avoidable and I had footprints showing the best route (and marking places that were slippery). After making my way along the very icy ledges above the summit of Mount Surprise I passed a couple in the forest. They were the owner of the boot prints I was following but informed me that there were still more boot prints ahead. They asked me if I had seen a hat during my hike and I told them about the hat and jacket. Apparently her backpack had been unzipped and they had accidentally fallen out. I felt bad that I hadn’t carried them up the mountain with me, but I hadn’t know if they were lost or purposely discarded. I let her know that they would be easy to find on the way down as they were right beside the trail. Beyond a small unnamed peak above Mount Surprise the snow became several inches deep and the going was a little faster with traction no longer being a problem. The snow was fluffy and sticky so bare-booting was fine. The trail continued on with many PUDs (pointless ups and downs) and no views to hint at how close the summit may have been. Several hours into the hike my legs started to severely cramp. My hiking condition had been decent all year long, so I didn’t know what was making the hike difficult. I figured it was either the weight from wearing boots and extra layers or that my legs were beat from the ridiculous number of squats I had been doing while exercising lately (even though the previous day was a rest day). I was starting to think that I was nowhere near the summit because the trees were still so tall and I had read that the peak was treeless. Just when I was thinking about turning around and giving up on Mount Moriah I saw a square white beacon ahead, a sign pointing to the summit. There was a small rocky climb up above the trees and to the summit. The peaks was just a big boulder pushing above the tree tops. It was very cold and windy on summit. 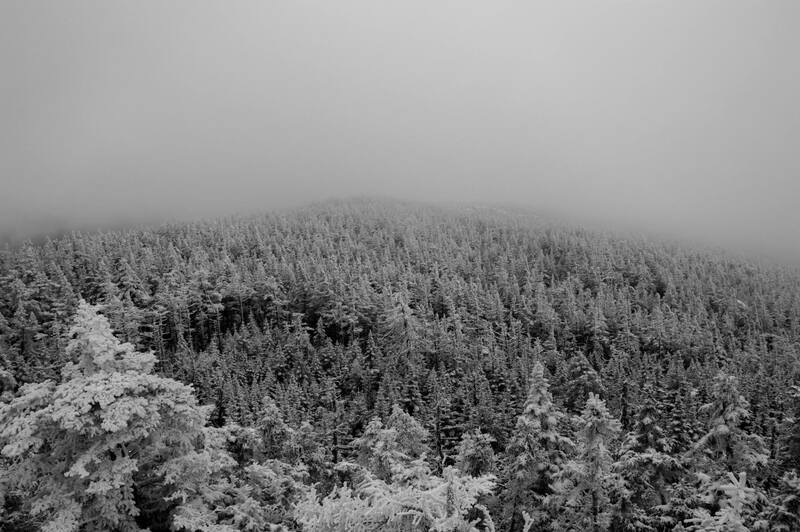 I had no view due to clouds but the sight of the ocean of trees around me covered in snow was amazing. I stayed on the summit as long as I could, jumping around, eating a protein bar and drinking a vegan protein drink. I was hoping for the clouds to break so I would have the clear sky the forecast promised. 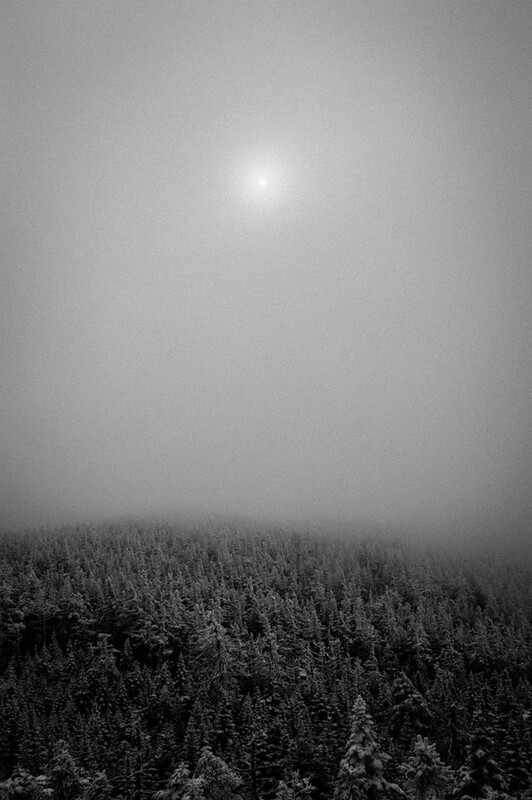 The sun tried hard, but it didn’t happen while I was there. My hands began to hurt from the cold so I headed down. Shortly thereafter I had to stop and put hands inside my shirt to warm them up. The couple I passed earlier came up the trail and asked if they were close. They too were discouraged and thinking about turning around. I let them know the summit was close but very cold, and wondered how long they would last on the summit with only a single hat between them. With my hands back to a reasonable warmth I got ready to continue my hike down but discovered my CamelBak line was frozen. It took a minute of sucking on it and squeezing the tube to get it flowing again. The hike down in the snow was quick but my leg cramps returned on the up-side of the PUDs. Once I hit the ledges above Mount Surprise again I pulled out my STABILicers. Even though they were old and worn, they gave me enough traction to continue on at a confident pace. 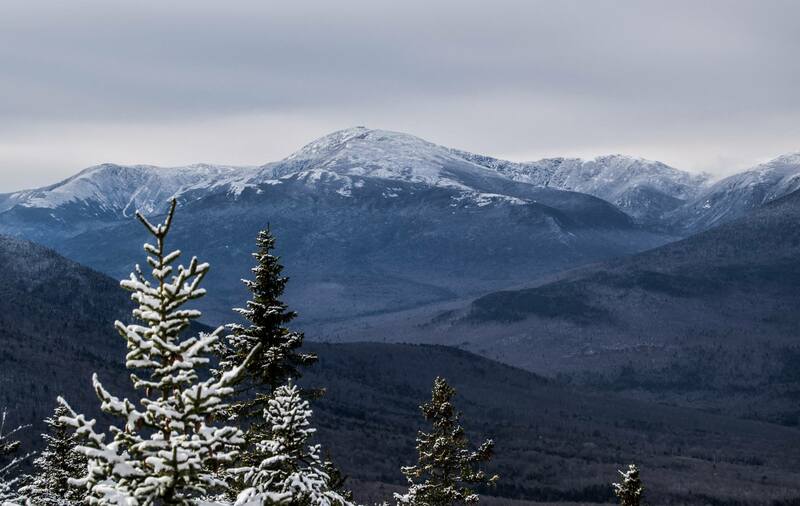 It appeared that the clear forecast somewhat hit when I walked out onto the vista above Mount Surprise and I got some stunning photos of Presidentials. Once I was past the icy ledges I pulled off my STABILicers and hung them from my pack. The rest of the hike was quick and easy. I started passing other people hiking up to Moriah and passed the lost jacket and hat, then hanging from branches trail-side. On the way out I picked up the discarded coffee cup and cleared a deadfall out of the trail. When I hit Bangor Street again I saw where people were parking along the road, there appeared to be room for 3 cars. 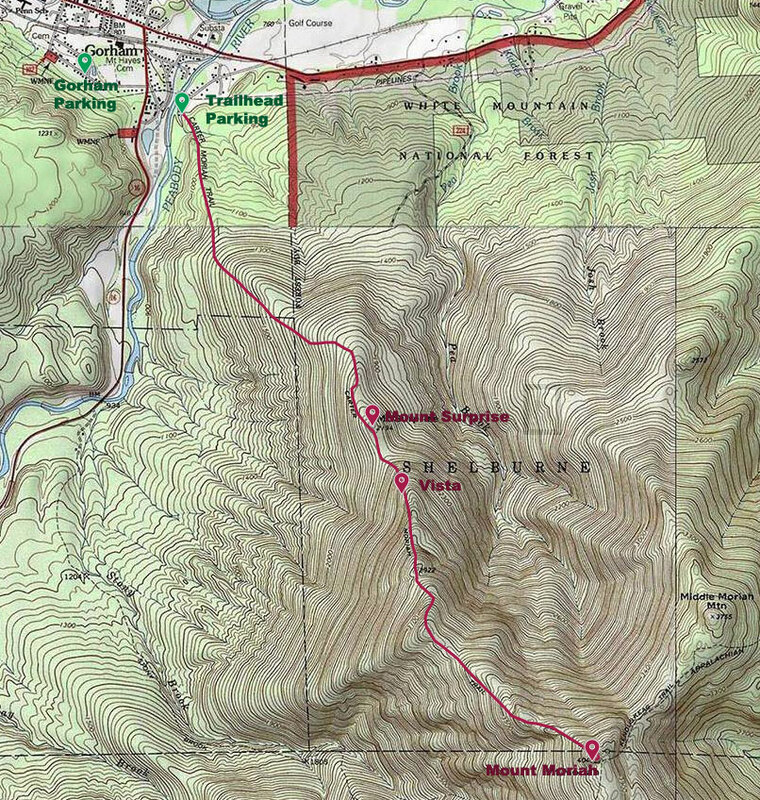 I stored that info away for future hikes (and marked it on the map from earlier in this post). I dragged myself back to my car and headed back to Portland, but not before stopping at Moat Mountain Smoke House and Brewery for a veggie burger and coffee. I was a little concerned about the amount of cramping I experienced during the hike and hope that my attempts to stay fit during the winter by doing CrossFit-like body weight training doesn’t continue to impact my future hikes. But I was also pretty psyched to get my first 4000 Footer in the snow and can’t wait for enough snow to start snowshoeing. “Barnes Field Group Campground.” http://www.fs.usda.gov. Forest Services, United States Department of Agriculture. Web. 6 December 2014. “Beginner CrossFit Program.” jasonharper.com. Jason Harper. 6 December 2014. “Cabin Fleece Sleeping Bag.” llbean.com. L.L. Bean, Inc. Web. 6 December 2014. “Grant’s Supermarket.” yelp.com. Yelp, Inc. Web. 06 December 2014. 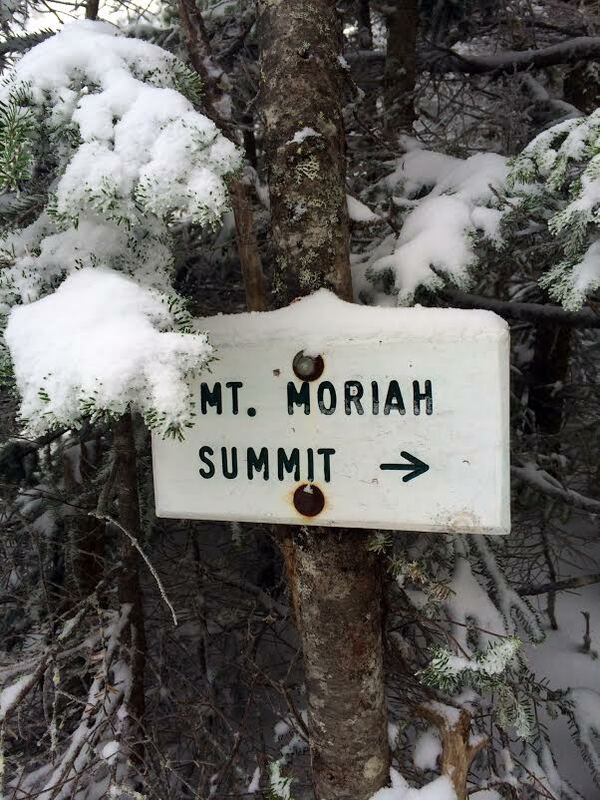 “Hike Mount Moriah.” 4000footers.com. 4000footers.com. Web. 6 December 2014. “Men’s Cold Gear.” underarmor.com. Under Armor, Inc. Web. 6 December 2014. “Moat Mountain.” moatmountain.com. Moat Mountain Smoke House and Brewery. Web. 6 December 2014. “Mt. Washington Auto Road.” mtwashingtonautoroad.com. Mt. Washington Auto Road. Web. 6 December 2014. 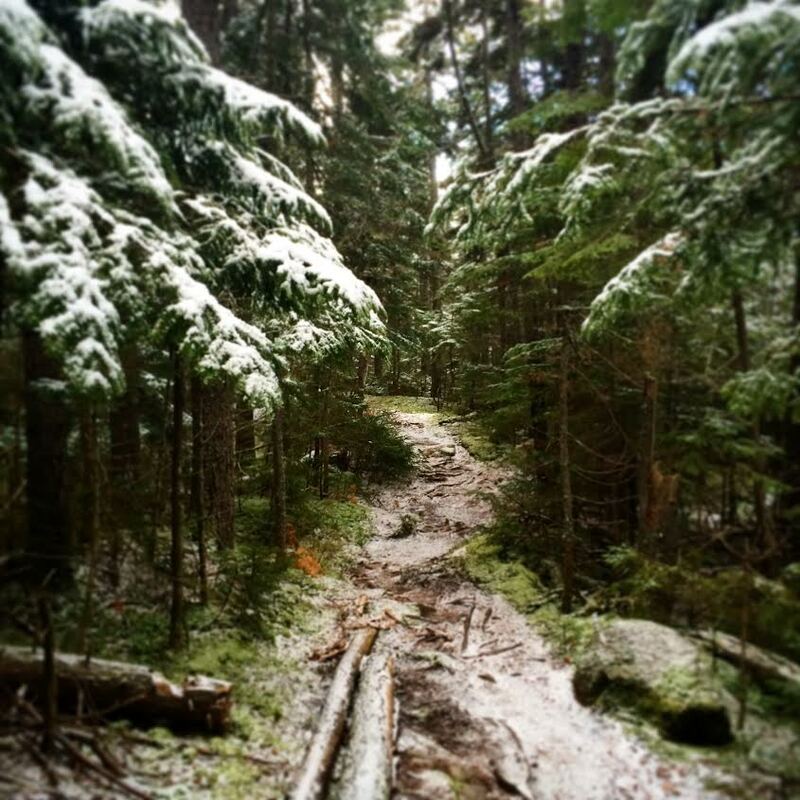 This entry was posted in Gear, Hike and tagged 4000 Footer, Barnes Field Campground, Gorham, Hike, Mount Moriah, Mount Surprise, New Hampshire, White Mountains. Bookmark the permalink. Good read, great pix, thanks. Cramping usually comes from dehydration, and I know I drink less when I hike in the cold …not sure if that’s what happened for you, but it seems worth passing along. Sage advice, thanks Jack. I go by the rule that if you are thirsty you’ve waited to long to drink, if you’re hungry you’ve waited to long to eat. So, I typically drink a lot of water. But, looking back I didn’t drink very much early on in this hike.